Jim Rice is running for a seat on the Montana Supreme Court which pays $125,000. The promotional ads for Jim Rice are playing in Montana, and he has a large billboard in Helena with a large smile, and in his black robe. Do Montana voters want to vote in an arrogant person that needs to see themselves on a billboard? With only 25,000 voters in the City of Helena, what does Jim Rice think he is accomplishing by putting up a picture of himself? Perhaps he had to spend some of that political money, some of which came in from out of state for favorable decisions. In 2007 the Montana Main St. blog published that the Montana Supreme Court can be swayed by the Montana Trial lawyer Association--by bribe. No doubt Jim Rice is on the take. Most importantly for viewers of this blog, up forever is Jim Rice Montana Justice did not believe orders from the Montana Supreme Court need to be followed. That is the big picture. 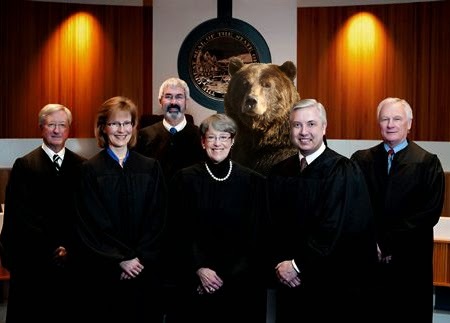 If Jim Rice had to be supervised as a law student, why does Jim Rice Montana Supreme Court Justice think law students now do not have to be supervised, and can be protected from Impersonation of a State Officer, and can perjur themselves to the Montana Supreme Court? On August 8, 2007 Angela Wetzsteon practiced unsupervised in Hamilton, MT. She is a 2008 graduate of UM Law School. Jim Rice, and these other justices decided that the Montana Supreme Court orders where not important, neither was the Montana Student Practice Rule created by the Montana Supreme Court on May 1, 1975--one of the first in the nation. Jim Rice did not violate the Student Practice Rule, but allowed other students like Angela Wetzsteon to do so. Jim Rice is pictured 2nd from right. sometimes I wondered why they were smiling. Until I realized that law does not matter in Montana. These people are smiling wide because they get paid by the taxpayers, and they screw them instead of protecting them. When you take bribes, or by fraud take money (The 2007 Zyprexia suit for Chief Mike McGrath), or by a household income with the US Attorney for Patricia Cotter, and the $125.000 baseline salary with bribes on top from the Montana Trial Lawyers Assn. Beth Baker wanted to look good, so she just went along. So Jim Rice Montana Justice earned his pilot's license at 17, so what. He is a corrupt goon, who clearly does not respect the law profession or its ethics by allowing a law student or many to practice law unsupervised. That means the Bar Exam, means nothing in Montana. The former chief, Carla Grey said the very same thing in a 1996 dissent, something Jim Rice woudnt have the nutsac for in 2014. Case reference: DA-10-0492 Montana Supreme Court from 2010: Spreadbury v. Wetzsteon et. al. All that matters is that the money comes in for Jim Rice, and he will sell his soul, his robe, and whatever else for this piece of the corrupt pie. The overdone smile is the "schelacking"﻿ on the Montana people by Jim Rice, and the Montana Supreme Court. Keep smiling Mr. Rice. I know you voted against a Montana Supreme Court order #12986 which made the student practice rule. Why then Mr. Rice do students even pay to attend the Montana Law School if they are already lawyers? Not everyone in the public are stupid Justices. Jim Rice should be voted off the Court for disrespecting the law profession, showing bias and lapse of ethics for allowing students to prosecute the Montana people in courtrooms. Shame on you Jim Rice, I dont forgive having my decorated career ended by a law student you allowed in a courtroom as a felon. It must have paid well Jim Rice; but how much has it paid your soul? THE ONLY WAY TO REMOVE THE PREDOMINANT BABY BOOMER WITH QUESTIONABLE ETHICS IS TO ALLOW THEM TO ATTRITION OUT---DIE OF NATURAL CAUSES. GENERATION X OR MILLENNIAL GENERATION CANNOT EXCEED GREED, CORRUPTION OF BABY BOOMERS.....OR STEVE BULLOCK.